Huddle Quilt - Easy and Free Diamond in a Square Pattern! 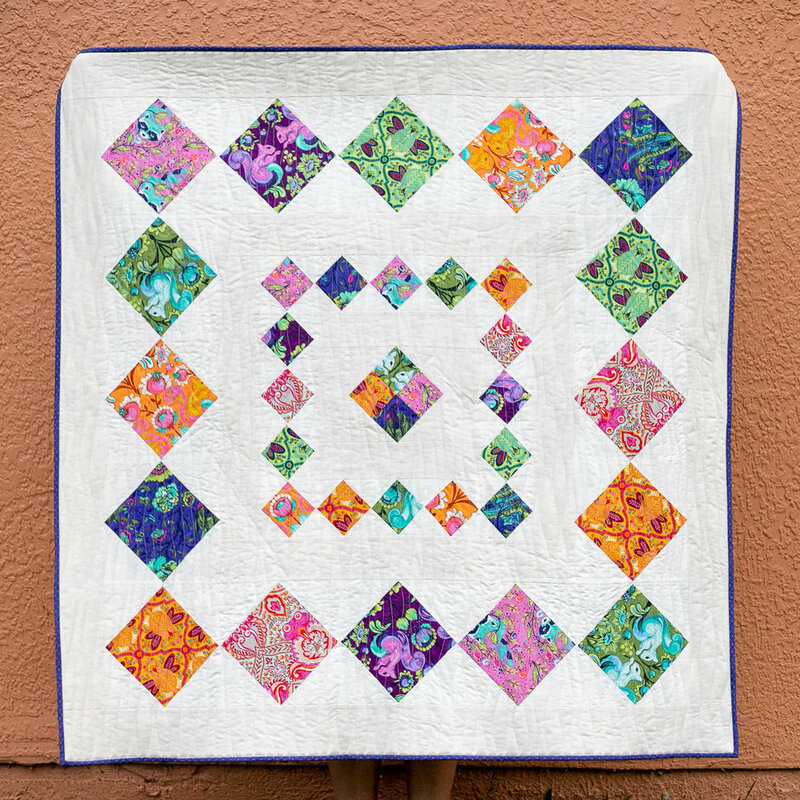 The Huddle Quilt is a fast and easy pattern that’s perfect for large prints because it makes them the focal point. Plus there is plenty of negative space to let the eye enjoy your favorite fabrics even more. It’s also a medallion quilt (albeit a very simple one) because the quilt top is pieced together starting at the center, and working outward - a technique that is similar to log cabin quilt blocks. My Huddle Quilt is a 54’’ square throw size. 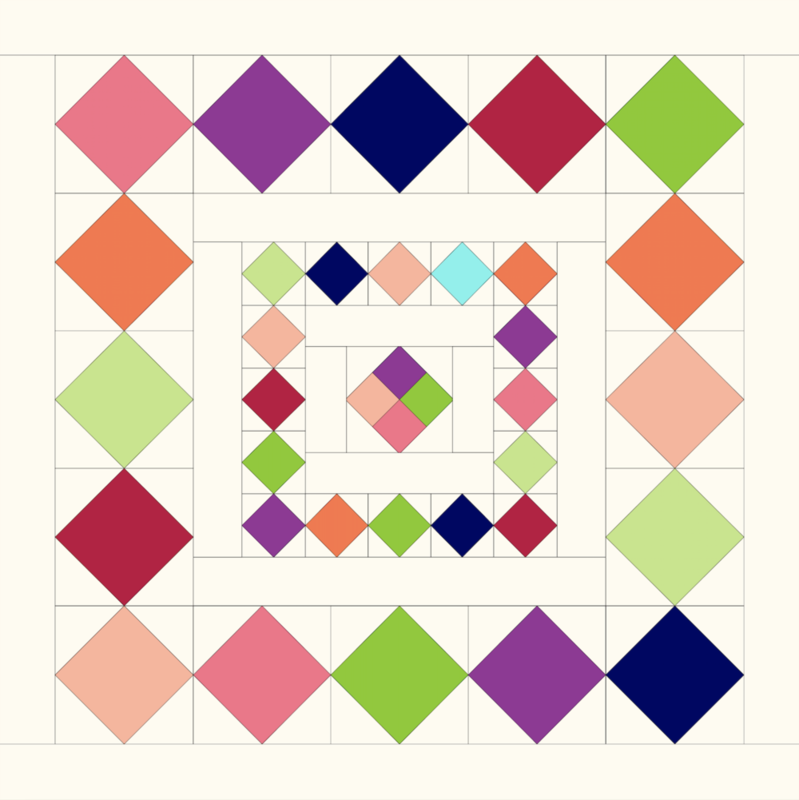 Some of you have asked so I will share with you: I also did the math for an 82’’ square queen sized Huddle Quilt, which simply requires one more round of Diamond in a Square blocks plus a border. I never completed this big size, but I will provide the instructions for adding those 2 extra rounds at the end of this blog post . Keep in mind you will need twice as much fabric to make the queen sized quilt. * Note about focus fabrics: as you can see above, I separated my Tula Pink All-Stars Fat Quarters into different colorways and then chose 2 FQ from each colorway. You will only use 1/2 of each fat quarter (or may use fat eighths of fabric) for 4 of the prints, and if you have at least 20 1/8’’ of usable width, you may use fat eighths (or half of a FQ) for all of the prints. See my cutting layout below. 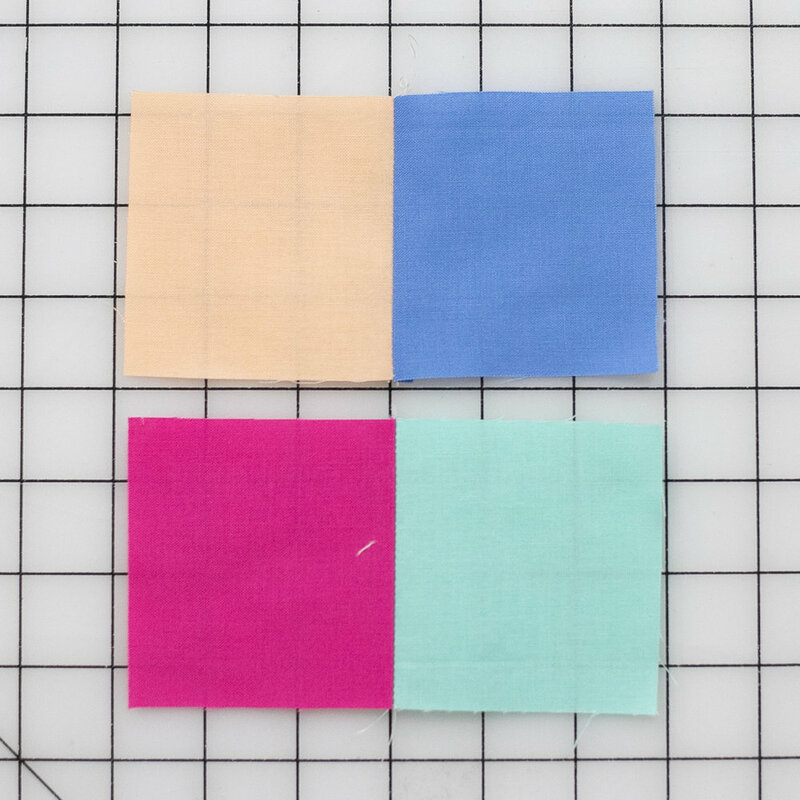 Divide the focus fabrics into two sets - each set will have four FQ’s, one fabric from each colorway. If there are smaller prints, put them in set 2. 1/4’’ seam allowance used throughout. 1. Use the four 3 1/8’’ x 3 1/8’’ focus fabric blocks to sew 2 rows of 2, and then sew the rows together. 2. Cut the two 4 3/4’’ x 4 3/4’’ background fabric squares in half diagonally. 3. Center a triangle along one side of the 4-patch square. Stitch. Place another triangle opposite the first and stitch. 4. Press the triangles away from the center of the block. Trim away the little ‘dog ears’ on both sides of the triangles to reduce bulk. 5. Sew two more triangles to the block. Press the triangles out. 6. Trim the block so it is 7 3/4’’ square. 1. Sew the two 3 1/4’’ x 7 3/4’’ strips to the sides of the block. 2. Sew the two 3 1/4’’ x 13 3/4’’ strips to the top and bottom edges of the block. 2. Center a triangle along one side of the 4-patch square. Stitch. 3. Press the triangles away from the center of the block. Trim away the little ‘dog ears’ on both sides of the triangles to reduce bulk. 4. Sew two more triangles to the block. Press the triangles out. 5. Square up and trim each block to a 4 3/4’’ square. 1. Arrange the small blocks around the the border of your 4-patch block in a way that you like. 2. Sew together 2 sets of 3 blocks in a row and 2 sets of 5 blocks in a row. 3. Sew the sets of three to the sides of the quilt top and the sets of 5 to the top and bottom. 1. Sew the two 3 3/4’’ x 21 3/4’’ strips to the sides of the top. 2. Sew the two 3 3/4’’ x 28 1/4’’ strips to the top and bottom edges of the top. 2. Sew the new triangles to the 7’’ squares in the same way that you did for the small Diamond in a Square blocks. Square up and trim each block to a 9 3/4’’ square. 1. Arrange the medium sized blocks around the quilt top in a way that you like. 1. Sew the two 4 1/4’’ x 46 3/4’’ strips to the sides of the top. 2. Sew the two 4 1/4’’ x 54 1/4’’ strips to the top and bottom edges of the top. Your throw sized quilt top is done! I sandwiched mine with a pieced backing and wool batting and quilted it with wavy lines. See my technique here. I did promise you instructions for making a queen sized quilt using this design. Cut the background squares in half diagonally and sew them to the edges of the large focus fabric squares. Trim each large Diamond in a Square block to 11 3/4’’ square. Arrange and sew together as seen above. Sew the shorter border strips to the sides and the longer border strips to the top and bottom, as you did before. If you make a Huddle Quillt (throw or queen), I’d love to see! Please tag me on Instagram @sewcanshe so I can check it out.